Klipsch were back in town with vintage 3-way speakers sourced by a VortexBox music server and amplification by Tsakiridis' Theseus 3-in-one integrated from Greece with phono stage and DAC. One may even roll EL84 or KT150 and run them in triode or pentode. Next was colour in the air. 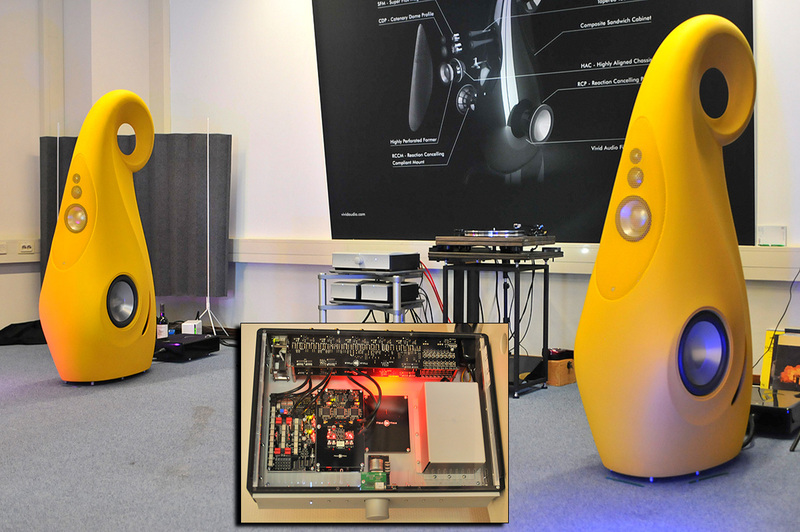 Vivid Audio's Giya G1 in bright yellow not only looked great but sounded likewise driven by dual mono Mola Mola Kaluga power amps with a Mola Mola Makua preamp with phono and DAC. Just add an analog and/or digital source and you’re off to the races. A second setup featured a smaller Giya model. ... Aalt-Jouk van den Hul also has a healing practice. 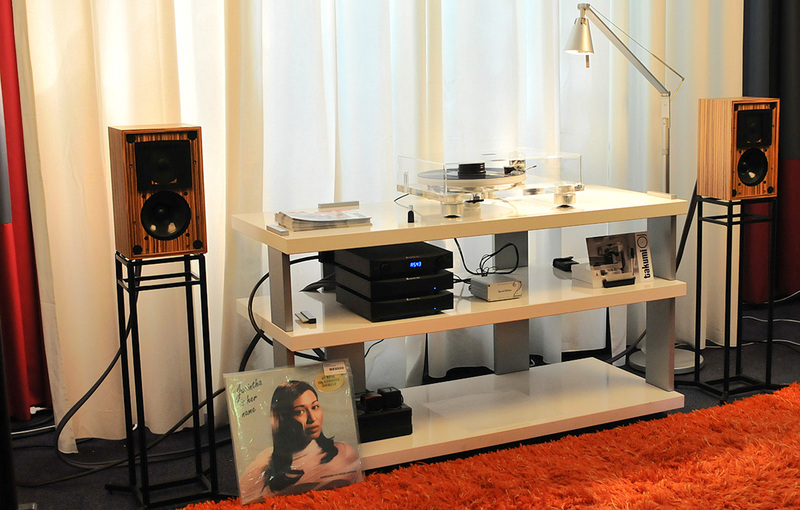 Now he has turned experiences from that para-medical practice into the audio world. The boxes atop the speakers were devised to make a non-EM based connection with the listener. We enjoyed an A/B with them on and off in a parallel connection to the loudspeakers' input and noticed a difference. There was more substance between the speakers while at the same time we both had the impression that the sound pressure had increased - an interesting development that needs more investigation (and of course the whole thing is proprietary). Pink Faun’s latest version of their streamer became source to an MSB DAC and Exogal Ion 100wpc power amplifier. 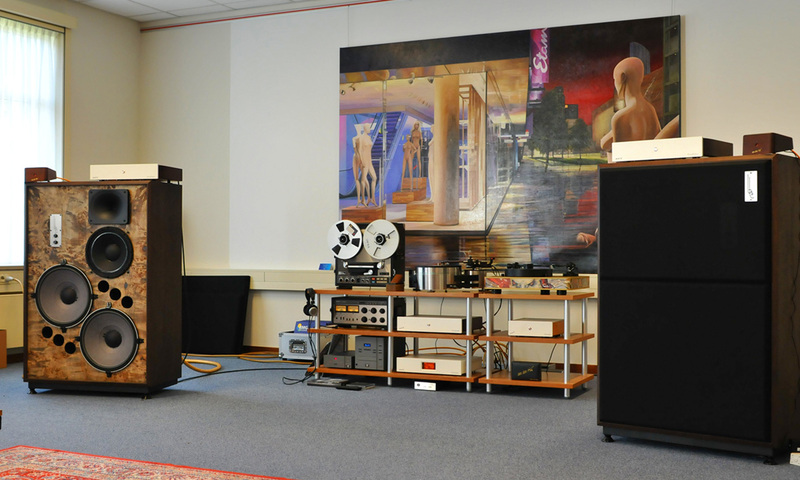 Speakers in this Very Fine Solutions room were Russell K Red 120. Russell himself joined Frank and Martine Vermeylen and we had a good laugh with this oh-so-typical Brit. On static display was the new Thrax DAC Ares which was just awaiting its final extension board. 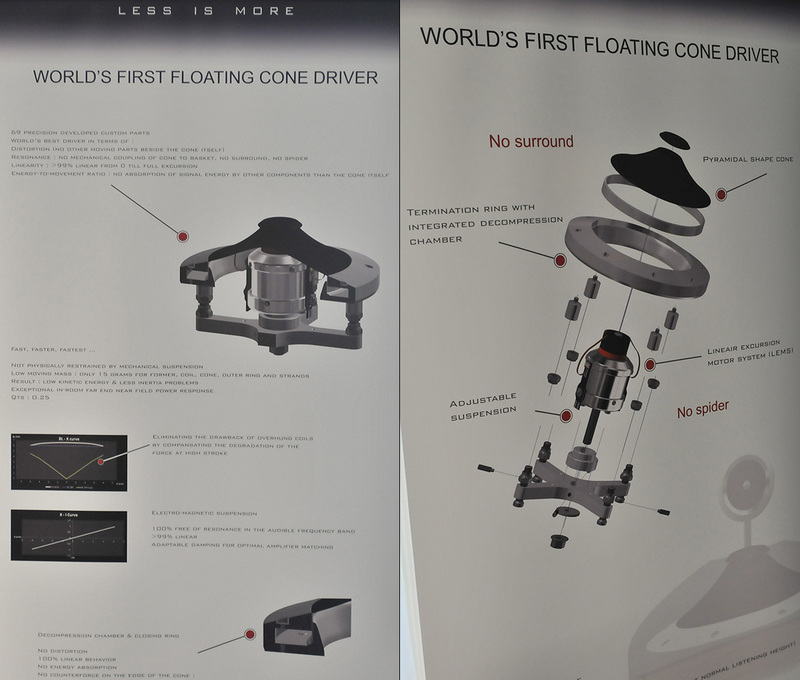 Have you ever heard of, let alone heard an, electromagnetic floating cone driver? We hadn't. Ilumnia is the outcome of 7 years of R&D with plenty of trial and errors and prototypes.The design goal was a driver that would be fast to track micro and macro dynamics; have very low distortion for undisturbed long-term listening pleasure; and exhibit excellent linearity no matter the SPL. The basic notion about 'how' was a driver cone with an electromagnetic suspension, not the traditional spider and surround. This should result in zero energy absorption, hence purer signal transduction. 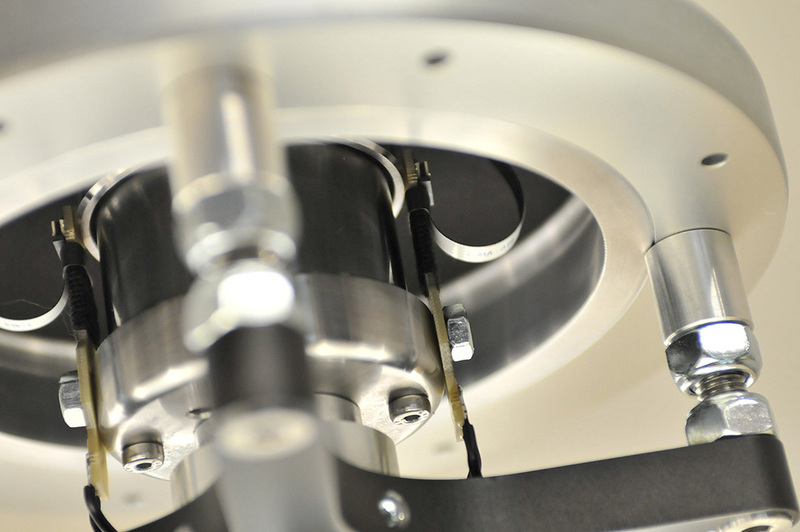 Compression from mechanical resistance would be nulled as would unwanted resonances from a spider or surround. Damping would be adjustable for the best match between speaker and amplifier. 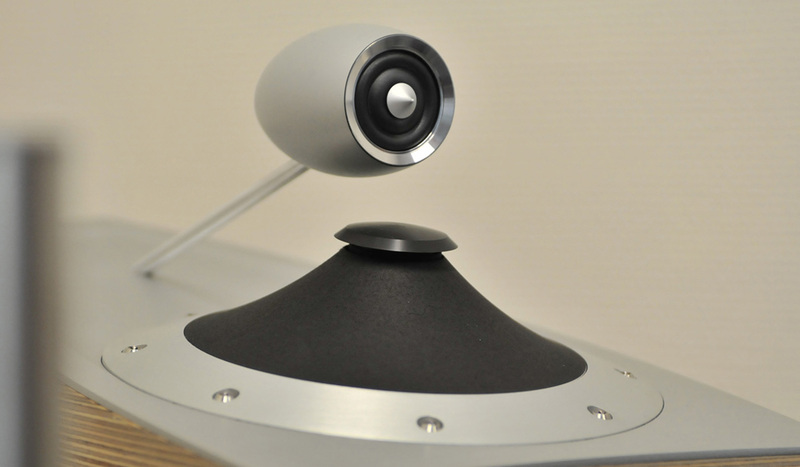 In the Magister loudspeaker on exhibit, the floating driver was mounted on top to radiate 360°. With just 15 grams of moving mass—the cone, former, coil and closing ring—this driver is really fast. The exploded view showed 68 parts. Ilumnia deserve our kudos for most innovative technique in audio. 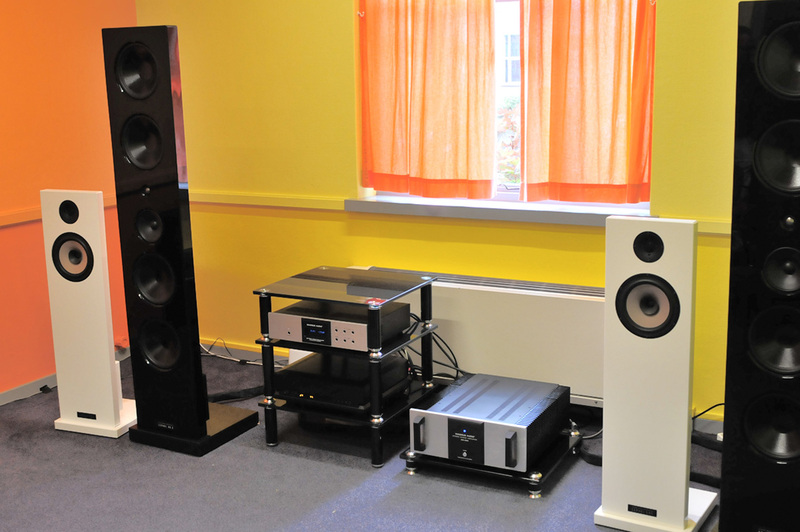 Etalon Acoustics from Hungary exhibited with two amplifiers, the models SuprA and CurrentA, the latter a current-based design better suited to electromagnetic speakers. 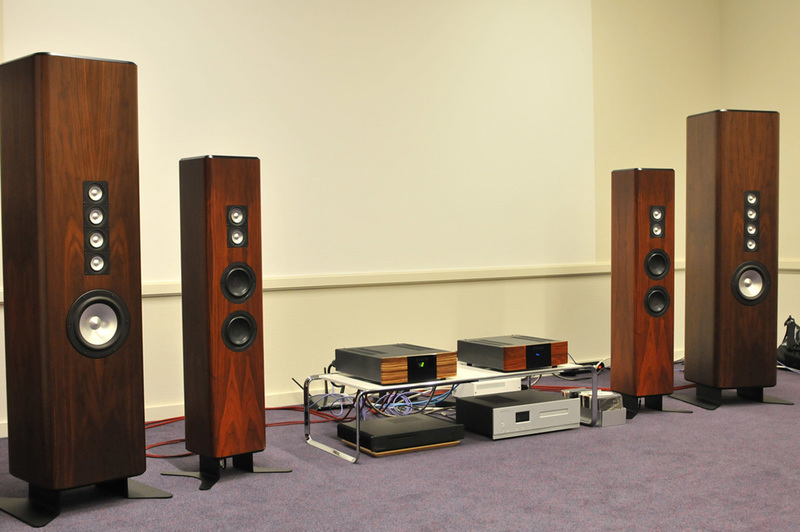 Two models of loudspeakers were also present, the Entree and larger Elixer. Their tweeters are composite metal types while the Entree uses two 5" carbon-paper woofers and the Elixer one 8" composite metal driver. 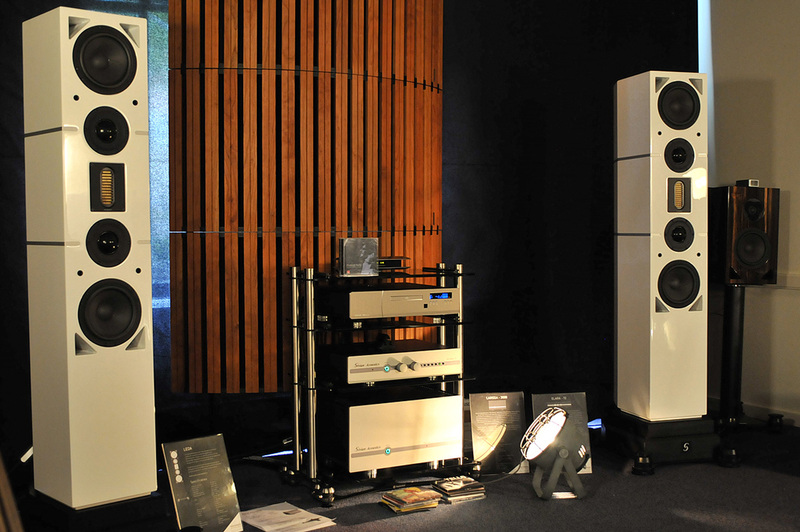 Avantgarde Acoustics remain our favorite horn systems. We still cherish our Duo Omega, even more now that after 15 years of heavy-duty (!) use, their woofers have been reconed. In Veldhoven the Germans had Armin Kraus as ringmaster fronting an orange pair of Trio with single pair of Basshorn in a large room. Big system + big room = temptation to turn up da juize. When done while playing German Krautrock at live SPL, one makes no friends in adjacent rooms. Playing Oompa after that— the beer fests came alive at the same level—doesn't, either. Back at normal levels, the sound returned to what we know and love. 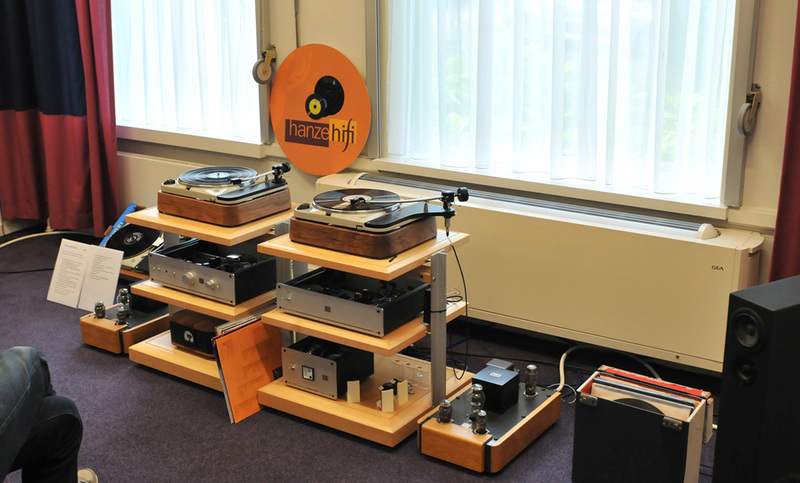 Much quieter and more introverted was the Hanze Hifi room where a love of vintage turntables and tube amps prevailed. 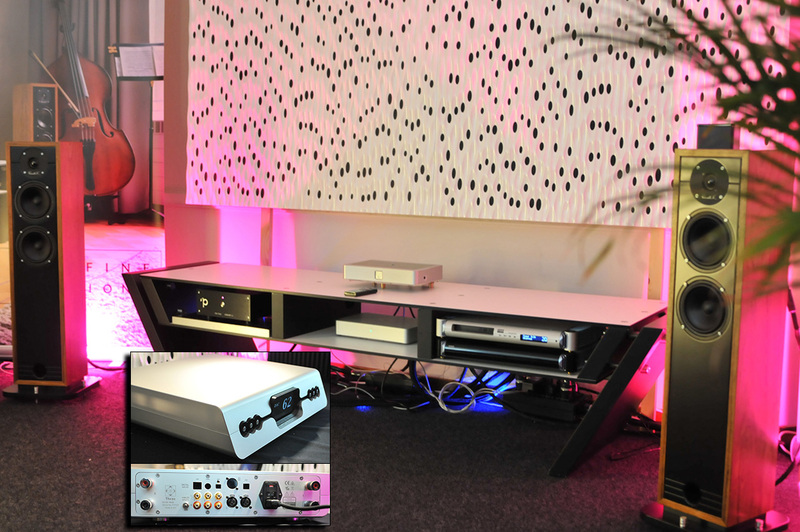 Audio Note UK showcased around the Meishu integrated 300B amplifier. Loudspeakers were the typical in-corner affair which continues to work for them. A very familiar pair of Dutch & Dutch 8c flanked a third one in the next room. Music was by TRPTK, a 'record company' that issues in various formats up to DXD and DSD at 11.2MHz. Content delivery is via CD, USB drive or FLAC download. 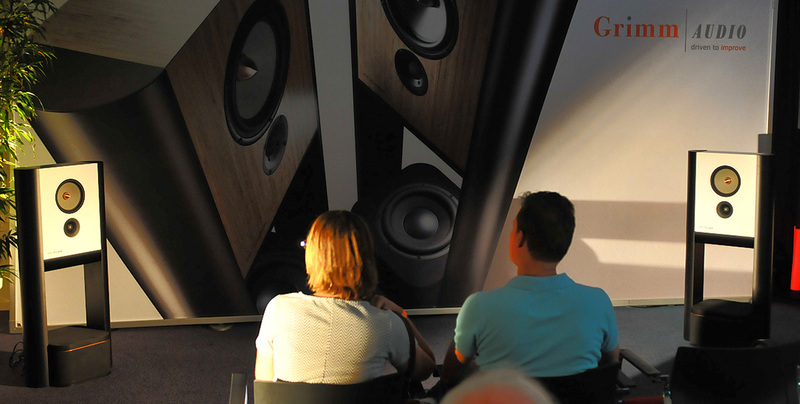 Sonically we recognized the quality of the Dutch, Dutch & Dutch which we described in their review. ... by the new Takumi Level 2.1 turntable that ships with Titanium tone arm, ceramic bearing axle and Ortofon 2Mred cartridge. As a package, it will cost you €795. Who says vinyl is an expensive hobby? 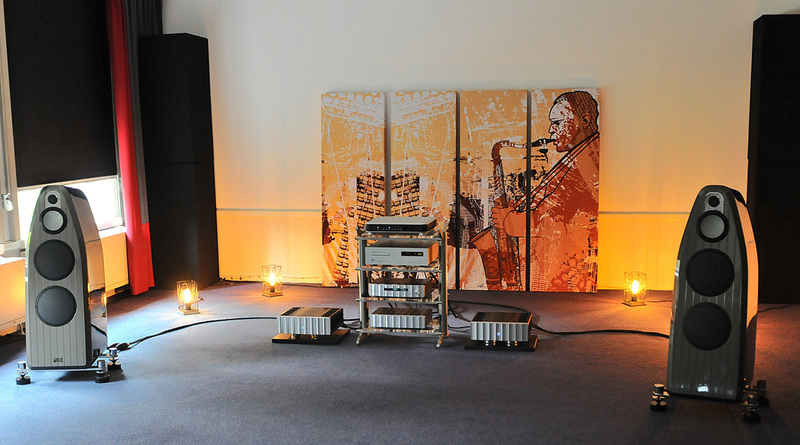 Mårten Coltrane 3 sat far out in a deep room with Jeff Rowland Corus preamp and model 725 monos while Analog Domain's DAC1 served up the music. Grimm Audio not only demoed their top model LS1be with beryllium tweeter but also the LS1a, the most economical version of their range. 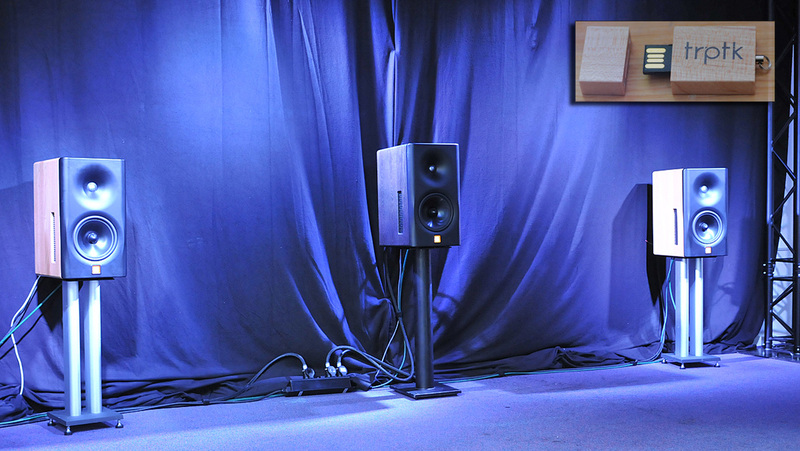 Just like Ken Ishiwata, Grimm use extreme toe-in to get the best sound and in the wide room, the near-corner setup produced an open and deep soundstage floating in space. A man, a room, a man alone in a room. That was part of Down Man by Dutch band Brainbox featuring Jan Akkerman in 1969. And here we had a man alone in the Driade room. 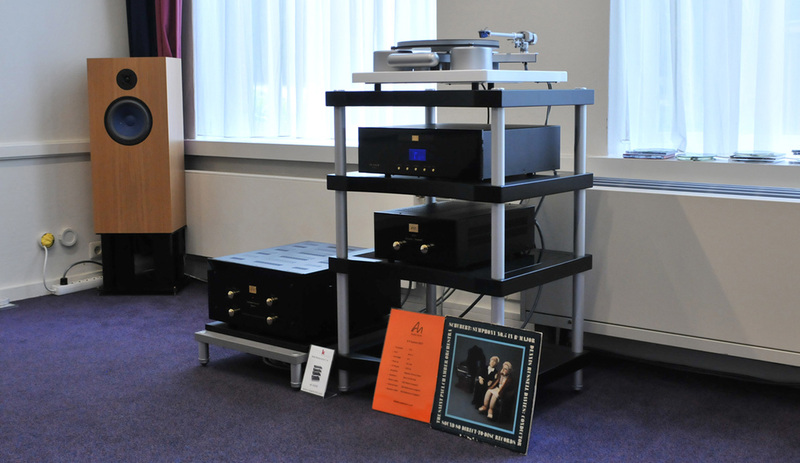 Zegers Music Innovations brought two open baffle systems. The larger model is called ZMI Cephei 20.2 and designed for rooms from 50sqm upward. The smaller one goes by Cephei 5.05. Their shared design goal is ultra coherence and linearity. What we heard reached that goal. 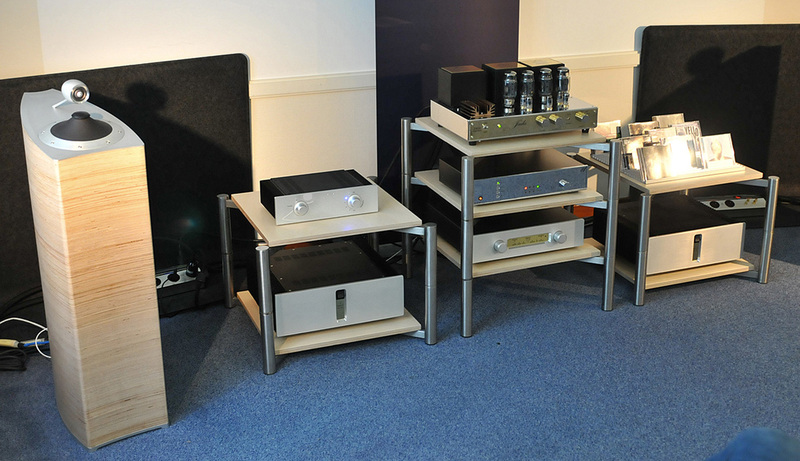 Æquo Audio teamed up again with Sound Galleries of Monaco and Mola Mola. 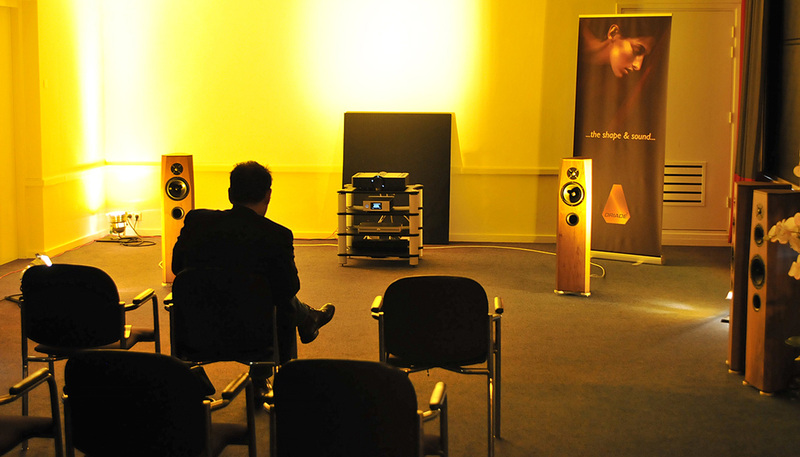 Solid sound occurred from the SGM 2015 streamer with T+A DAC8 into the Mola Mola amps. Emile Bok of Taiko Audio, one of the partners in the SGM 2015 streamer project, had reworked the T+A DAC8, with top and bottom plates from pure CNC’d copper. To finish off there was a 3mm bore in the center à la Franck Tchang, i.e. a vibration drain hole. The result was more than expected; a highly recommended upgrade. Another of his projects are EM cleaners in the form of wooden blocks with undisclosed contents which connect to the ground of the equipment to be treated. The connections are made via a spare USB or RCA port. Geoffrey Armstrong who'd flown in from Monaco announced some further enhancements to the streamer which result in lower CPU usage and temperatures of the passively cooled device. Æquo meanwhile are coming soon with both a smaller and larger model to bracket their current Ensis. The last room on our schedule were Sivian Acoustics. 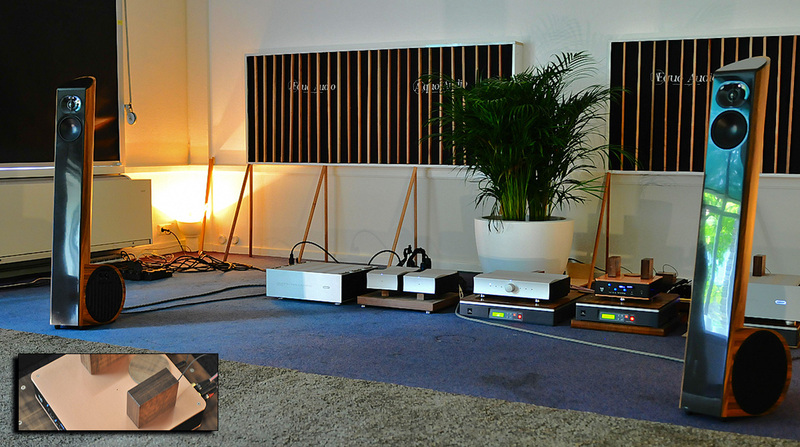 Here the Leda time-aligned 3-way loudspeakers with AMT tweeters and Elara preamp with Larissa power amp showed off. 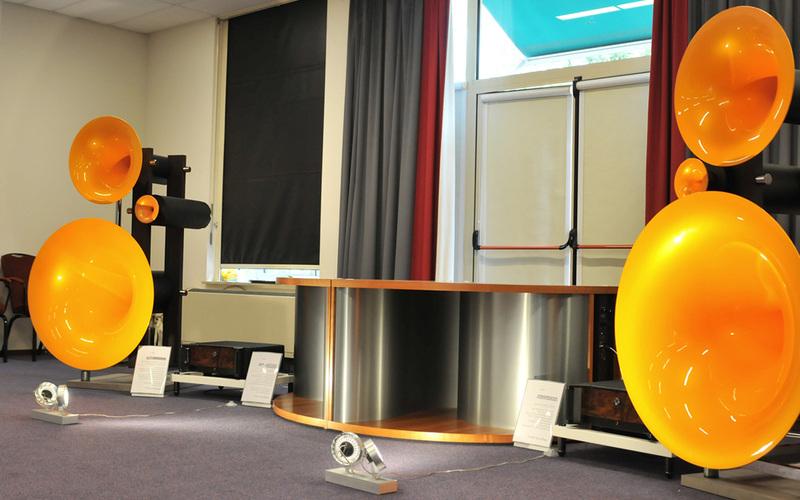 Sivian is yet another Dutch company that not only caters to the demanding hifi hobbyist but also to the pro (PA) market. Two full audio days took their toll. Walking, listening, talking to exhibitors and visitors, taking photos and copious notes was tiring but fun. We recommend to anyone planning to visit next year to book a room in the hotel. There you can wind down after a long day and be ready for the next. We enjoyed the XFI 2017 and hope to be back next year.